School of Geography, Queen's University, Belfast, BT7 1NN. This article attempts to further our understanding of tells in southeast Europe by considering their landscape context, where the research methodology comprises an innovative hybrid of modern landscape theory, and GIS-based visual analysis. Tell landscapes are explored through the detailed analysis of a group of case study tells located in the Romanian Plain, in southern Romania, dating to the fifth millennium BC. A visual, so-called phenomenological approach is adopted, but novel to this paradigm is the use of GIS as the prime tool with which to conduct visual research. GIS offers a convenient means to visualise and quantify visual parameters of landscape, but its formal nature also brings some rigour to phenomenological research, which has been criticised for lack of standard method. Viewshed tools are utilised in standard form, but also in enriched ‘Higuchi’ and ‘Directional’ forms. The temporal nature of tell settlements is explored through the generation of viewshed maps from different cultural levels of the mound. Results of the analysis are presented and common patterns in the dataset identified. Taking inspiration from the Heideggarian notion of dwelling, a generalised interpretive framework is forwarded. It is suggested that tells were located with respect to visual entities in the environment, and that the nature of the visibility tells us something of the lives of people dwelling on and around them. The article is derived from a lecture given at the Theoretical Archaeology Group conference, Manchester, December 2002. 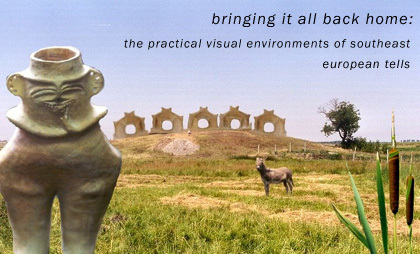 Key Features: A critique of traditional approaches to the study of prehistoric tells, The integration of contemporary archaeological landscape theory and GIS-based visual methods, The implementation of Higuchi and Directional viewsheds, The introduction of temporality into site-based viewshed analysis, To argue that less specific, more holistic interpretive frameworks are required in order to accommodate results deriving from diverse case study topographies. How visual analysis informs our understanding of changes in settlement configuration in the river valleys of southern Romania in the fifth millennium BC.